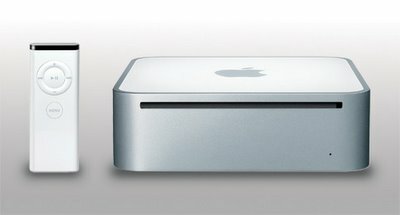 The Mac mini has always been a great idea. Not much bigger than five CD cases (6.5 inches square and 2 inches tall) it is reasonably priced, as quiet as a quiet thing, and attachable to just about any low-priced keyboard, mouse and monitor on the market. And with WiFi built-in, I'm guessing this is only the start of Steve's carefully planned takeover of your home entertainment system. Steve Jobs, with his instinctive grasp of litotic understatement calls it "Home Stereo. Reinvented". Using his equally familiar 'Reality Distortion Field', he managed to avoid mentioning that this is another 'Corporate And Lacklustre Product Name'. The iPod Hi-Fi is a three-driver (two 80mm mid-range with a sealed acoustic suspension and a 130mm dual voice coil woofer featuring a ported bass reflex design) amplified speaker system in a sealed resin enclosure. It will ship with inserts designed to accommodate virtually all of Apple’s dockable iPod models. There is an auxiliary input in the back if you have an iPod shuffle or other personal stereo. Built-in handles let you lug the 8kg (think 8 bags of sugar) system around — it’s white and rectangular, with a (removable) black grille. It is designed to be mains-powered, but it can (just) run on batteries — six Mars Bar-sized D cells (reminds me of those 'battery-powered' 70s ghetto blasters). The specifications indicate that it will be plenty loud (Apple quotes 108 decibels at 1 metre; that's the kind of volume a chainsaw generates). 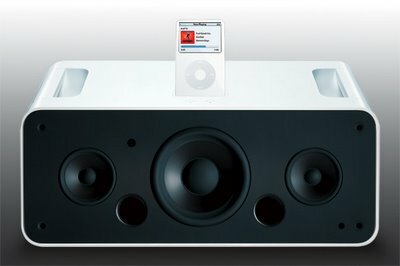 Apple has updated the iPod’s software to accommodate the new speaker system — a new software update will add a 'Speaker' menu to the iPod’s interface, allowing users to adjust tone control, control the backlight and switch to a special 'large album art' setting via the (supplied) Apple Remote. It costs $349 (£200, but add at least £30 to that when it arrives in the UK). I'm sure it will sound great. I'm even more certain that it will be a tremendous success (I can picture the heads of a dozen iPod accessory manufacturers' CEOs thudding against their mahogany desks). However, I personally question the need for stereo in a device of this type. 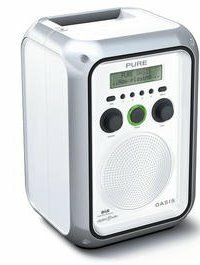 And if you're a bit short of cash and can live without a custom iPod dock, there is a UK-designed device that will amplify your iPod, is available for half the price, comes in iPod-complementing white and grey, has a rechargeable battery that can last up to 14 hours between charges, AND has a DAB digital radio built in. Visit the Pure site to see it. I've listened to it, and the large, mono speaker produces a full, natural sound that comfortably and enjoyably fills a normal sized room. And at just 1.5kg, it seems positively iPod-like compared to the (urgh... still hate that name) iPod Hi-Fi. (Apologies to those of you for who this is REALLY old news. The reason for this blog is that I regularly come across people who don't know this stuff). 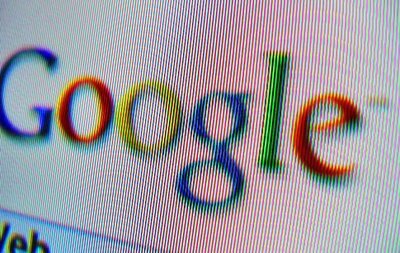 There aren't many people left online who don't use Google to look for things. However, it is capable of doing a lot more than just searching for stuff. Currency Exchange: Type $??? in pounds to get the latest rates. Movies: Type movie:??? for a roundup of reviews. Telephone: Type in the name and post/zipcode of the company. Calculator: Type in any basic equation. Unit Conversion: Type 2.3 kilograms = ? pounds. The SXSW (South by South-West) Music and Media Conference celebrates its 20th anniversary this year, as it showcases hundreds of musical acts from around the globe on over fifty stages in downtown Austin. 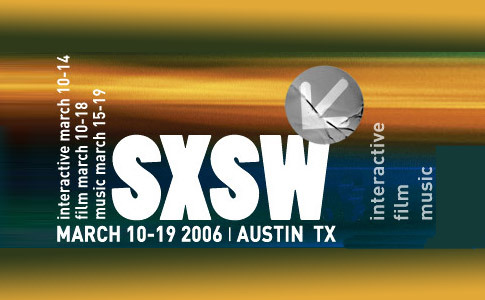 This year's marks the 20th Anniversary of the SXSW Music And Media Conference and Festival, which will take place March 15 - 19, 2006. "[SXSW] has grown from being a jolly spring get-together for a few hundred US indie labels and musicians in search of a deal, to an international gathering that is the most important date in our music industry calendar." Over 1200 acts played last year before more than 8000 registrants from all over the world. Pop, jazz, country, blues, reggae, hip hop, electronica - every imaginable style of music, from nearly every continent - is represented each night at over 50 of Austin's premier stages, many within walking distance of one another. SXSW 2005 released a bittorrent of MP3s showcasing each of the performing acts. I downloaded it in April 2005 and still haven't listened to all of the hundreds of songs that were contained in the (massive) zipped file. Among the ones I have listened to brought bands like Aberfeldy, Ambulance Ltd, The Crimea, The Earlies, Maximo Park and VHS or Beta to my attention. If you want to supplement your digital music collection with 941 contemporary (and legal) files (and you have three and a half gigabytes of free disk space! ), click here, for information of how you can access them. 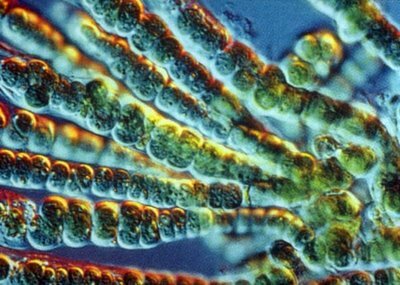 Sam Jaffe at Wired reports that researchers at the University of California at Berkeley have engineered a strain of algae that could, with further refinements, produce vast amounts of hydrogen via photosynthesis. Blue-green Algae floating on the surface of the world's oceans already produces the majority of the world's oxygen supply via photosynthesis. This new strain of algae, known as C. reinhardtii, has truncated chlorophyll antennae within the chloroplasts of the cells, which serves to increase the organism's energy efficiency. In addition, it makes the algae a lighter shade of green, which in turn allows more sunlight deeper into an algal culture and therefore allows more cells to photosynthesise. "An increase in solar conversion efficiency to 10 percent... is thought to be enough to make the mass culture of algae viable," says Juergen Polle, a former student of Melis’ who now does research on algae at the City University of New York, Brooklyn. Polle points out that Melis has probably already reached that 10 percent threshold. But further refinements are still required before C. reinhardtii farms would be efficient enough to produce the world’s hydrogen, which is Melis' eventual goal. Currently, the algae cells cycle between photosynthesis and hydrogen production because the hydrogenase enzyme which makes the hydrogen can’t function in the presence of oxygen. Researchers hope to further boost hydrogen production by using genetic engineering to close up pores that oxygen seeps through. CoverFlow is a free (Mac-only) program that does one task very well indeed. It allows you to browse your iTunes song collection in a similar way to which you would if you were browsing through your CD (or LP!) rack. When you find the album you want to listen to, you double-click on it and a temporary playlist is created in iTunes. Elegant, and a definite boon to those of us (very old people) who are used to choosing our music in this fashion. You can jump to a particular letter using keyboard commands, or search for albums by name... and if you have a sideways scrolling mouse, you can 'flick' through the covers (if you don't, the arrow keys work just fine). - If you haven't already done so, you will spend hours downloading cover artworks for your iTunes tracks. Not just for ones that you haven't already got, but for the ones that now look shoddy when displayed in this way. - It uses a LOT of hard-drive memory. Cataloguing my 20,000 song collection added half a gigabyte of CoverFlow specific files to my hard drive. 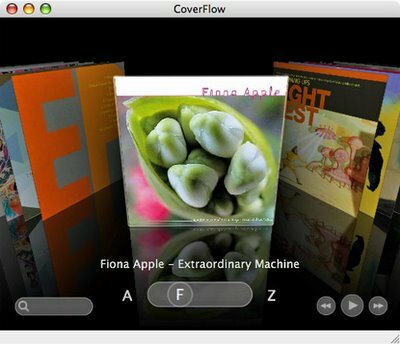 - It requires a fast Mac, running Tiger (it runs OK on my 1.33 GHz PowerBook, but check the system requirements listed on the CoverFlow site before downloading it). - It is still a beta product, so it can be flaky, especially when first loading the cover artworks. – Albums are alphabetised by the first letter of the album's artist, just like iTunes... this is another limitation of digital, hard to think how this could be solved without a clumsy 'Apple, Fiona' type listing convention. - You can't choose multiple albums. - Like any digital product, it can only work with the data it has, if you haven't labelled your music properly, it won't display it properly... you can't flip the covers over to look at the back, or zoom in to read the tracks, pull out the inserts to read the lyrics, etc, etc... of course, all these things would be theoretically possible, but would entail even larger memory overheads (and hard work on the part of the user!). If any of you do try it out, I'd be interested to know what you think of it. And if there is a similar program avaiable for PCs, let me know. This kind of micro-financing is about as close as most of us are ever going to get to invest (not donate) our money, helping very low-income microentrepreneurs start or expand their own microbusinesses in order to grow their income and break cycles of generational poverty. Kiva is using technology to keep the costs of this kind of personalized service to a minimum. Here's how it works. You go to kiva.org web site and browse through a selection of pre-reviewed loan applications. You get to read an overview of the borrower (including photo), what business they want to invest money in, what size of loan they are requesting and how much they have raised so far. Once you've found someone you'd like to make a loan to, you can instantly (using Paypal) make a loan for a portion (minimum 25USD) or all of the remaining loan ask size. All of the money is managed by Kiva's web service with human intervention so it is very cost efficient and scalable. Once the borrower has received a full funding of their loan, then they are given the loan typically with a 6-12 month repayment (with interest) period. All of the pre-screening and on-the-ground loan management is outsourced to local Kiva microfinance partners. The partners assign a loan officer who is responsible for posting all of the loan "application" information on the Internet and to write journal entries (essentially a blog) along the way as there is new information to report. All of this information is available for easy access by loan providers (and anyone else who is interested) through Kiva's web site. Additionally, loan providers are emailed with updates when there is a new posting with one of their loans. Kiva is also not yet (and for the foreseeable future) paying any interest back to loan providers ... the most the you can get back is the amount loaned. They are using the interest income generated to pay for operating cost which are substantial. Kiva is therefore a non-profit and is still heavily subsidised. This is a reasonable strategy. Most people won't care about getting interest on a loan of $25-100, so this works fine. In the worst case of the loan not getting paid back, your loan becomes a charitable gift. In the early 1980s I was working as a freelance designer from a small studio near London. In the corner was a (for its time) state-of-the-art stereo system which provided the audio accompaniment to our days' (and often nights') work. It was one of the first systems I had ever seen with a remote control, and I remember much fun (read 'annoyance') being generated by people stealing the remote and changing the volume at inappropriate times. One evening I was alone in the studio, grappling with another stupid deadline. A recently purchased cassette of Brian Eno's Music for Airports seemed a fitting accompaniment to the work I was attempting. The problem was that I couldn't get the volume 'just' right… no matter how lightly and briefly I pressed the volume control on the remote, the sound levels were either too high, or too low. 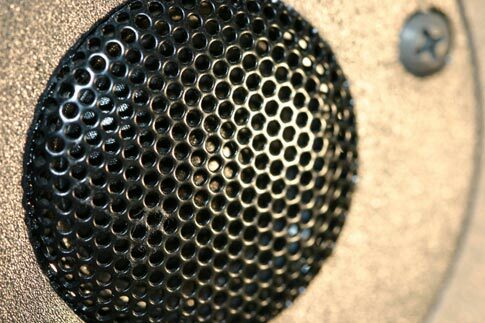 Using the volume slider on the amplifier itself was no better. Unlike the analogue rotary controls I was used to, this system adjusted the volume digitally, in 'steps'. And '1' was too soft, and '2' was too loud. There was no '1-and-a-bit'. Without realising it, I had hit one of the limitations of 'digital'. At its root, things are either 'on' or 'off'. The engineers who had created the volume control mechanism hadn't allowed enough 'steps' at the lower end of the adjustment scale, making it impossible to get the volume into the 'Goldilocks Zone'. My solution was appropriately analogue, I set the volume to '2' and draped a couple of towels over the speakers. Yes, I am a genius. Light Blue Optics has developed a hologram-based technology for miniature laser projectors. Their latest demonstrator unit is matchbox-sized. 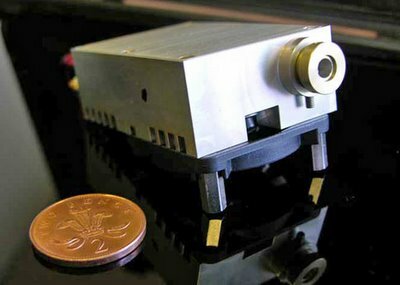 Projectors based on this technology could be used to display images from a range of mobile devices, the most obvious being PDAs and mobile phones. If you want to know more about the technology, type 'light blue optics hologram' into Google. 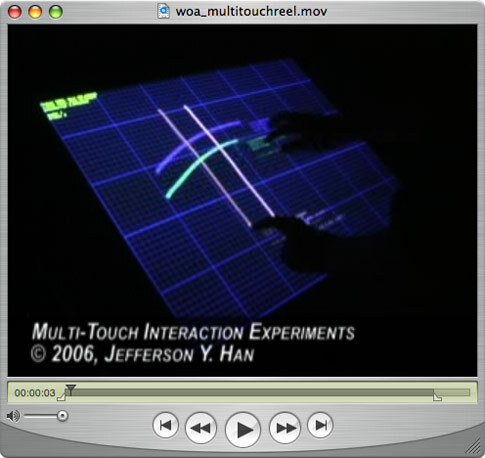 The significance of this development is that it overcomes the size limitation of conventional projection techniques and, for that matter, LCD screens. It has no prisms, no fans, in fact, no moving parts at all. Its power consumption is modest and the image it produces is high-resolution and always in focus. The technology works, and it could be mass-produced very cheaply. 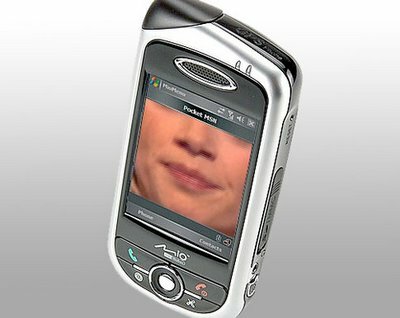 Imagine a mobile phone where you could project a high-resolution image on to any available flat surface. It could be happening sooner than you think. (Note: This article is part of a series I started on my BrettStuff website so, if you want to read the previous articles, pay it a visit). Theft has existed since organisms began competing for resources. In fact, the act of stealing is an evolutionary advantage for individual creatures – why go to the trouble of finding, killing or growing stuff, when you can filch the result from some other hard-working idiot? However, theft is destructive to societies. For this reason communities of all eras and cultures have instituted heavy penalties for all forms of stealing. What constitutes stealing is also an ancient issue. And as societies developed, the definition of theft has been refined and extended. However, the arena of 'intellectual property' has always been difficult to define. Two (linked) historical developments made the concept of intellectual property a significant issue. The expansion of trade between European cities and the appearance of non-church universities in the 12th and 13th centuries produced a literate and educated group of people who were interested in accumulating and exchanging information. This typically took the form of handwritten manuscripts, and a new trade emerged called 'stationery' where people would (for a fee) produce handwritten copies of your publication. The largest patrons of stationers were libraries (you paid to visit a library in those days), eager to stock the widest range of contemporary texts. Hand-copying of books was slow and costly. The man most often credited with changing this is Johannes Gutenberg (1398-1468), a metalworker and inventor, who devised a method for casting individual metal letters, setting them in blocks, applying a thin film of ink to their surface, and transferring this ink to sheets of paper. Gutenberg didn’t invent printing - China and East Asia had libraries with thousands of books printed using hand-carved wooden blocks as early as the 12th century - but he did refine and commercialise the process. Gutenberg's presses led to a boom in the production of texts in Europe. His most famous work, the Gutenberg Bible sold for the 'bargain' price of 300 florins a copy. This was still the equivalent of 3 year's wages for an average citizen, but a lot cheaper than a handwritten Bible, which could take a scribe as long as 20 years to produce! 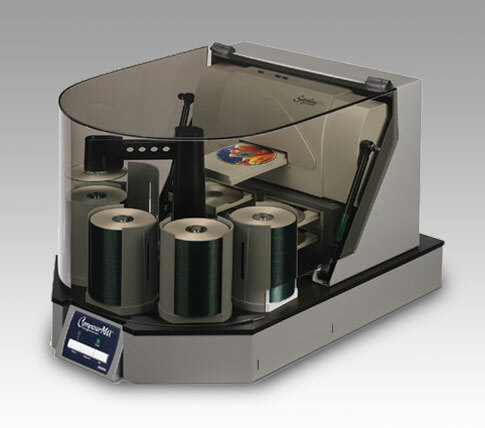 Printing revolutionised the distribution of knowledge by making it possible to produce a large number of copies of a single work at a reasonable cost in a relatively short amount of time. In fact one of the (not very snappy) names used for printing at the time was ‘the art of multiplying books’. The process spread to other German cities by the 1450s, to Italy in the 1460s, and then to France and the rest of Europe. The rapid spread of knowledge made possible by Gutenberg's printing press contributed to the Renaissance, the Scientific Revolution, and the Protestant Reformation. For this reason, Gutenberg was chosen by Time Magazine as the 'Man of the Millennium'. In the next installment we’ll look at some of the consequences of Gutenberg’s new toy. Video phones are ubiquitous in Japanese cities. One of the social gestures that is emerging is the habit of kissing the screen at the end of a call to a child or partner. For a good article on how mobile phones are affecting our social habits, visit momus's latest article. In a press-release that could almost have been timed to coincide with Valentine's day, Mattel have revealed that Barbie and Ken are back together. What do you mean, you didn't realise they'd broken up? For those who've been living in a cave, in February 2004, after almost 43 years of being 'an item', Mattel announced the break-up of Barbie and Ken. As is usually the case there was a younger man involved, an Australian surfer dude called Blaine. But Blaine is history. Ken has won Barbie back again and, unlike most men, he has changed! Gone are the beach-bum swimming trunks and T-shirts, Ken's wardrobe now contains a choice of cargo pants, a fitted suit with peak lapels and a trendily distressed faux-leather jacket. He's also indulged in some subtle cosmetic surgery, including a facial resculpting, giving him a more defined nose and a softer, more contemporary mouth. And (steady now ladies) he's now interested in Buddhism and enjoys cooking. There have been a few uncharitable souls who've accused Mattel of desperation, including the resolutely unbiased Isaac Larian, chief executive of MGA Entertainment, manufacturer of Barbie's chief competition, Bratz. He recently declared the reunion of Barbie and Ken as 'nothing but stupid publicity'. For a good article on the Barbie phenomenon, visit Brian Draper's LICC blog. Check out these URLs for some wonderful interface ideas that look more like something out of iRobot or Minority Report than what we know as real-life! In the last DvA article, my good friend Dr Conrad Gempf (who, despite being a Lutheran and a theologian, is an OK guy) contributed some 'comments'. I'm going to respond to them in a Q&A manner, because a. they are good comments, and b. if I don't, he'll probably ruin my next article by putting loads of other comments at the end of this article. Conrad's comments are in italics. For those times when you think "I want to hear a song," yeah. Is that primarily how you think of your music collection, though? A vast collection of songs? Is that how you want to think of your collection? 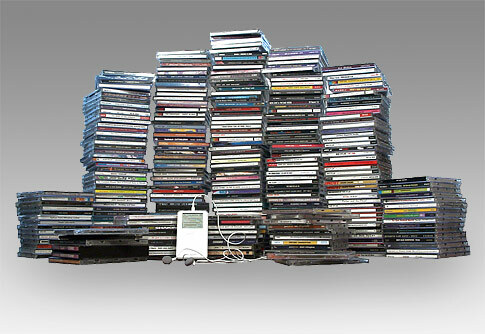 I do think of my music collection as a 'vast collection of songs'. But not in a mathematical, impersonal way. In fact, more than any other collection of stuff that I possess (books, DVDs, typefaces), it is an organic collection. One song can trigger memories of another song, via a wide range of assocations, time, location, emotion, tune, lyrics... which is why having a huge number of songs 'on-tap' is something I enjoy, and the ability to find, list, organise and play them in a huge number of different ways, as the mood takes me! A CD collection arranged alphabetically encourages you to think not "I want to hear that song" but rather "I want to listen to that artist" and you put them on and a few songs will surprise you "Oh, I forgot that was on there." A CD collection stored by genre encourages you to think differently as well. Yes, all those things are true. However, most of those things are also an argument 'for' rather than 'against' using iTunes. As I mentioned in DVA#3 I started organising my CD collection by genre. However I soon realised that a lot of CDs had a mix of genres, in fact, even deciding what genre an individual track was became tricky. 'Another First Kiss' by They Might Be Giants, humour? love song? pop? rock? alternative? That's why I (reluctantly) chose alphabetical. But that gave its own problems. Do I file the CD under 'Sting' or 'Police', 'Wilson' or 'Beach Boys', 'Mike Scott' or 'Waterboys'? (oh the childish joy of realising 'Maria McKee' and 'Lone Justice' nestled together!). I do use (multiple) genres on some tracks, but often to exclude as well as include. Songs with offensive language get marked 'profanity', novelty songs with 'smileworthy' or 'bad taste', so I can prepare playlists that are guaranteed not to include them! However the huge choice that iTunes provides can end up restricting you! However, the previous Previa had been fitted with a very substantial audio/visual system, including a dock for my iPod. This has now been transferred to the replacement Previa, however in the intervening weeks, I was reacquainted with using CDs. For the best part of four years, CDs have been bought, transferred onto my PowerBook's iTunes library, then 'filed' in one of my CD collections. And so it was that I found myself choosing and loading 6 CDs into a cartridge before my regular trip to pick up the kidz. The first thing i noticed was how it limited my selection process... I had to decide on which 6 CDs I was going to use for the whole journey... 96 tracks, rather than the 15,000 that I usually have 'on-tap'. After a few minutes deliberation, I put in some old favourites, Brian Wilson's 'Live at the Roxy', Bob Dylan's 'Live 1996', World Party's 'Goodbye Jumbo' and Westlife's 'Face to Face' (OK, I might have lied about the Westlife album). And so the journey began. It was as the second Brian Wilson CD came to a close I realised it had been months since I had listened to an album all the way through, and how much I had enjoyed the experience. My iPod allows me to do this, but I had got used to listening to it much like my own personal radio station, rather than sequential tracks. The 'album' mode will be selected more frequently from now on. And don't you miss looking at the rack without a clear idea of what to play and feeling like some CD is calling for your attention? Your subconscious has fashioned a link between the music and the experience of looking at the cover such that looking at the bank of covers is browsing experiences as well. Much of this can be simulated with cover art and smart playlists, but not taking in the vista of a couple of shelves of CDs at once and thinking "Which of these do I feel like hearing next?" And if your collection includes classical works, well, smart playlists still can't seem to handle symphonies as units made up of sub-units. And I miss the days when I'd look forward to a new Cockburn album coming out, thinking "It'll be good to hear what he's been up to lately." It was like catching up with an old friend. I don't seem to have that same relationship with musicians now, for a variety of reasons. One of them is that now iTunes and eMusic are teaching me to evaluate each individual hermetically Song Unit and decide "Do I want this one? This one? This one?" Yes, I agree with this, and it is another reason why the 'listen to by album' is something I'll be doing more of in the future. However, there have always been tracks that I just plain dislike, and it is good to be able to avoid them completely. And now I can listen to a random selection of everything by Bruce Cockburn. Or everything by Bruce Cockburn between 'Nothing But A Burning Light' and 'The Charity Of Night', or every Bruce Cockburn track with the word 'fall' in the title (there are three in my collection). Like all technology, we shape it, then it shapes us. It is our job to make sure that we exploit the advantages, avoid (and fix) its pitfalls, and acknowledge the areas where the old is better than the new. If Conrad doesn't force another diversion, I'll be looking at that in the next DvA article. There are lots of good reasons for owning a Mac, but one of them is the high quality of the interface, and just how easy it is to customise it. There is a plethora of (free) icons available from sites like Iconfactory. The site also gives details of various ways you can apply these to your Mac to make it 'yours'. But, if you want to employ these graphics in other ways, e.g. as avatars for your Adium, iChat or (heaven forfend) MSN applications, you need to convert these fonts into a graphics format they understand. Iconverter (geddit?) 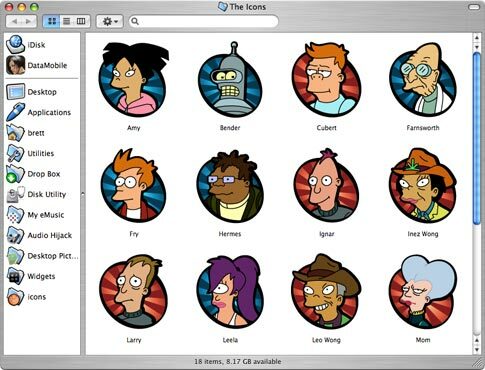 is a (free) application that allows you to drop the icon you like on it, and save it in a number of formats (.png gives good results with most icons). You then use the resulting file in the applications of your choice. Furby's inventor Caleb Chung's latest creation is called Pleo. Modelled on a one-week old Camarsaurus, it has been engineered to mimic life with organic movement and behaviors that allow him to relate to humanity on a personal level. Pleo is able to use simultaneous sensory inputs along with a sophisticated behavioral platform to act independently and express himself through motion and sound. 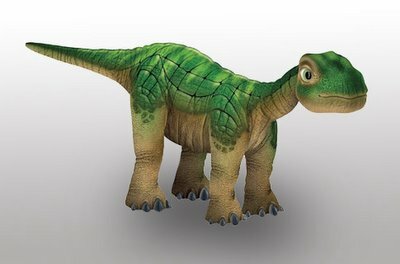 Pleo can convey emotions, is aware of himself and his surroundings, and evolves in behaviour over time. Second Life is a virtual world. Created in 2003 by San Francisco-based Linden Lab it gives its 'residents' tools that allow them shape the way this computer-generated universe looks and works. Residents also retain the intellectual property rights to the objects they create (although they are required to offer Linden Lab an open license to it). With over 130,000 subscribers, and its own currency 'Linden Dollars' (275 LD = approx. 1 USD), Second Life even boasts its own economy. Nearly 5,000,000 USD changed hands in January 2006. 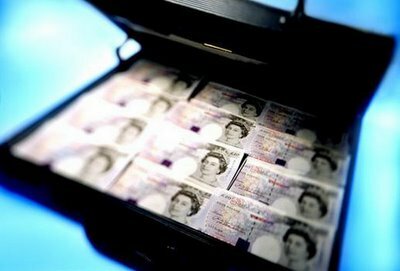 Much of this money is paid to people who design custom 'avatars'(online representations of yourself), and items such as chairs, vehicles and dwellings. Wired has published a fascinating article about people who make a living from doing this. Second Life is available for PCs and Macs (a Linux version is also in the pipeline). Monthly subscriptions start at 6 USD (1,650 LD). 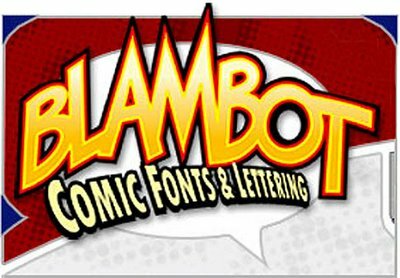 Blambot produces a wide range of high-quality typefaces for the comic and graphic-novel market. 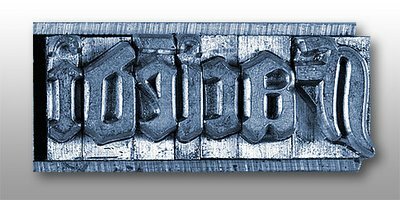 Their site is worth visiting just for the articles on comic design, but an added incentive is that they offer a number of excellent free fonts, suitable for Macs and PCs. Click here to go to the fonts page and scroll down the left hand column. The ones without a blue or red dot are the free ones. My personal favourites are Anime Ace, Swingset and Webletterer. Well, I'm the first to admit that there's something unnatural… something unseemly… about rock stars mounting the pulpit and preaching at presidents, and then disappearing to their villas in the South of France. Talk about a fish out of water. 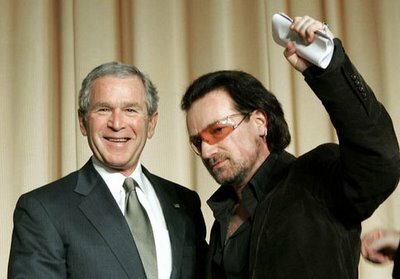 It was weird enough when Jesse Helms showed up at a U2 concert… but this is really weird, isn't it? I'd like to talk about the laws of man, here in this city where those laws are written. And I'd like to talk about higher laws. It would be great to assume that the one serves the other; that the laws of man serve these higher laws… but of course, they don't always. And I presume that, in a sense, is why you're here. Yes, it's odd, having a rock star here - but maybe it's odder for me than for you. You see, I avoided religious people most of my life. Maybe it had something to do with having a father who was Protestant and a mother who was Catholic in a country where the line between the two was, quite literally, a battle line. Where the line between church and state was… well, a little blurry, and hard to see. So fast-forward 2,000 years. That same thought, grace, was made incarnate - in a movement of all kinds of people. It wasn't a bless-me club… it wasn't a holy huddle. These religious guys were willing to get out in the streets, get their boots dirty, wave the placards, follow their convictions with actions… making it really hard for people like me to keep their distance. It was amazing. I almost started to like these church people. It was what Colin Powell, a five-star general, called the greatest W.M.D. of them all: a tiny little virus called A.I.D.S. And the religious community, in large part, missed it. The one's that didn't miss it could only see it as divine retribution for bad behaviour. Even on children… Even fastest growing group of HIV infections were married, faithful women. When churches started demonstrating on debt, governments listened - and acted. When churches starting organising, petitioning, and even - that most unholy of acts today, God forbid, lobbying… on AIDS and global health, governments listened - and acted. God is in the slums, in the cardboard boxes where the poor play house… God is in the silence of a mother who has infected her child with a virus that will end both their lives… God is in the cries heard under the rubble of war… God is in the debris of wasted opportunity and lives, and God is with us if we are with them. "If you remove the yolk from your midst, the pointing of the finger and speaking wickedness, and if you give yourself to the hungry and satisfy the desire of the afflicted, then your light will rise in darkness and your gloom with become like midday and the Lord will continually guide you and satisfy your desire in scorched places"
It's not a coincidence that in the Scriptures, poverty is mentioned more than 2,100 times. It's not an accident. That's a lot of air time, 2,100 mentions. [You know, the only time Christ is judgmental is on the subject of the poor.] 'As you have done it unto the least of these my brethren, you have done it unto me.' (Matthew 25:40). As I say, good news to the poor. Here's some good news for the President. After 9-11 we were told America would have no time for the World's poor. America would be taken up with its own problems of safety. And it's true these are dangerous times, but America has not drawn the blinds and double-locked the doors. In fact, you have double aid to Africa. You have tripled funding for global health. Mr. President, your emergency plan for AIDS relief and support for the Global Fund - you and Congress - have put 700,000 people onto life-saving anti-retroviral drugs and provided 8 million bed nets to protect children from malaria. But here's the bad news. From charity to justice, the good news is yet to come. There's is much more to do. There's a gigantic chasm between the scale of the emergency and the scale of the response. Because there's no way we can look at what's happening in Africa and, if we're honest, conclude that deep down, we really accept that Africans are equal to us. Anywhere else in the world, we wouldn't accept it. Look at what happened in South East Asia with the Tsunami. 150, 000 lives lost to that misnomer of all misnomers, "mother nature". In Africa, 150,000 lives are lost every month. A tsunami every month. And it's a completely avoidable catastrophe. Preventing the poorest of the poor from selling their products while we sing the virtues of the free market… that's a justice issue. Holding children to ransom for the debts of their grandparents… That's a justice issue. Withholding life-saving medicines out of deference to the Office of Patents… that's a justice issue. That's why I say there's the law of the land… and then there is a higher standard. There's the law of the land, and we can hire experts to write them so they benefit us, so the laws say it's OK to protect our agriculture but it's not OK for African farmers to do the same, to earn a living? This is a dangerous idea I've put on the table: my God vs. your God, their God vs. our God… vs. no God. It is very easy, in these times, to see religion as a force for division rather than unity. Do to others as you would have them do to you.' (Luke 6:30) Jesus says that. Thus sayeth the Lord: 'Bring the homeless poor into the house, when you see the naked, cover him, then your light will break out like the dawn and your recovery will speedily spring fourth, then your Lord will be your rear guard.' The Jewish scriptures say that. Isaiah 58 again. America gives less than one percent now. Were asking for an extra one percent to change the world. to transform millions of lives - but not just that and I say this to the military men now – to transform the way that they see us. To give one percent more is right. It's smart. And it's blessed. In 1989 I purchased my first CD player to supplement the amp, tuner and cassette deck that comprised my design studio’s sound system. I also bought my first CD, a copy of Bob Dylan’s Oh Mercy. Month by month I added more shiny discs to my collection. At first I stored the CDs thematically. However, once the collection grew to more than 300, this became impossible to maintain, and so I adopted the conventional (male?) ‘alphabetical, by artist’ approach (with ‘Now That’s What I Call A Great Marketing Idea’-type albums in a separate section). As time went by, I got a CD player at home as well, and some of the CDs began to migrate there, also stored alphabetically. Fast-forward to 2006. I now possess over 3,000 CDs. A third of them are housed in my Slough-based design studio. Another third are stored in various locations in my house. The other third are with various family and friends I’ve loaned them to over the past 20 years (deep sigh...). 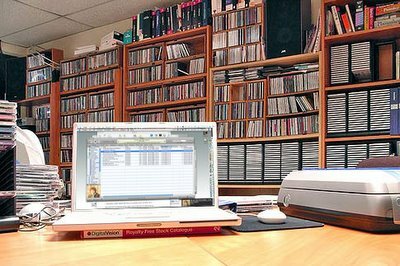 e. Remember where the CD was (studio, home, on-loan, car…). However, now that all the songs I possess and enjoy are situated on my PowerBook, when I think of a song I want to listen to I merely type a few letters into the search bar of iTunes and ‘Hurrah!’, there it is (along with a number of other, easily distinguishable tracks containing the same key words). No more worrying whether the track is by Kevin Prosch, or the Black Peppercorns, or if it is on the CD he did with Bryn Haworth. No more struggling to remember what that song is called on Blonde on Blonde with the great ‘everybody must get stoned’ refrain at the end of each verse, just type in ‘blonde’ and ‘dylan’, view the 12 tracks, and then, if necessary, play a few bars from each. Of course, if you’re anything like me (pause for long silence, followed by skyward stares and tuneless whistling), you also type ‘everybody must get stoned’ into the ‘comments’ field of the track, making it even easier to find! (The track is ‘Rainy Day Woman #12 & 35’, but then, you’ve probably already looked it up on Google :-). Now, I could get even more boring on this subject (no, really, I could!). How I make ‘smart playlists’ to make sure I don’t have to listen to the same song twice in any given month, to filter tracks that might be embarrassing in certain situations, or... OK, I’ll stop now, while I’m behind. What I do know is that iTunes allows me access to music in ways that were previously impossible. I don’t forget to put the CD back in its case, or put it in the wrong one. I’m not constrained to one method of storage or selection. And I can carry my entire collection around with me wherever I go. But it's not perfect. The ghost of analogue is never far away, and never more so than with this kind of stuff. And we'll be looking at that in the next DvA article. Last week, the final Western Union telegram was sent... probably by someone who wanted to be the last person to ever send a Western Union telegram. Baron Pavel Lvovitch Schilling (1780-1836), a Russian diplomat in Germany, was the inventor of the telegraph, consisting of a single needle system in which a code was used to indicate the characters. The very first line of the electromagnetic telegraph was set up in Schilling's apartment. 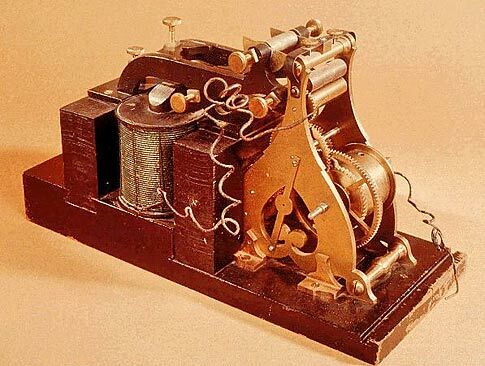 In 1832, Schilling demonstrated the transmission of signals by positioning two telegraphs of his invention - his telegraph said to be the first electromagnetic telegraph in the world - in two different rooms of his apartment. Schilling was the first to put into practice the idea of the binary system of signal transmission. The first commercial electrical telegraph was constructed by Sir Charles Wheatstone and Sir William Fothergill Cooke and entered use on the Great Western Railway. It ran for 13 miles from Paddington station to West Drayton and came into operation on April 9, 1839. It was patented in the United Kingdom in 1837. Samuel Finley Breeze Morse was a professional artist. Educated at Phillip’s Academy at Andover, he graduated from Yale in 1810 and he lived in England from 1811 to 1815, exhibiting at the Royal Academy in 1813. He spent the next ten years as an itinerant artist with a particular interest in portraiture. He returned to America in 1832 having been appointed Professor of Painting and Sculpture at the University of the City of New York. It was on this homeward voyage that he overheard a shipboard discussion on electromagnets. Morse’s decision to change his career path was possibly due in part to his failure in 1836 to secure a commission to paint the Rotunda of the Capitol building, a commission he had expected. He did not entirely lose contact with his art, being President of the National Academy of Design from 1826 to 1845. Morse's real achievement was in developing both a telegraph machine, and an appropriate 'language' to use with it. The first message sent by the electric telegraph was "What hath God wrought" (taken from the last line of Numbers 23:23), from the Supreme Court Room in the Capitol to the railway depot at Baltimore on May 24th 1844. The Western Union company formed in April 1856 to exploit the technology of the telegraph to send cross-country messages in less than a day, rather than the weeks or months that it took when sending them by mail. Telegraph operators were an elite breed; fluent in transcribing text into the series of dots and dashes that were transmitted from one telegraph machine to another, and of course visa-versa. A good telegraphist could transmit 40 to 50 words per minute. They are the first people documented to suffer from repetitive strain injury. Telegrams reached their peak popularity in the 1920s and 1930s when it was cheaper to send a telegram than to make a long distance telephone call. People would save money by using the word 'STOP' instead of full-stops to end sentences because punctuation was extra while the four character word was free. Telegrams were used to announce the first flight in 1903 and the start of World War I. During World War II, the sight of a Western Union courier was feared because the War Department, the precursor to the Department of Defense, used the company to notify families of the death of their loved ones serving in the military. but remember, "no sooner than three weeks before the date on which it is required, enclosing as 'proof' a birth certificate or a marriage certificate as appropriate. If the marriage took place abroad, up to six weeks should be allowed". Fascinating fact to throw into a lagging conversation: Morse used his easel as the armature of the first telegraph apparatus he built. Sorry for forcing you to make an extra 'click', but as I started this series on my other site, I thought I'd finish it there. If you haven't visited the BrettStuff site before, why not scroll down and read the whole series, then hit the 'back' button to make some seminal and witty comments on this blog?